We picked up a couple more tapes from Chad Vangaalen's cassette series at his show here in Calgary a couple of months ago (editor: man, are we out of practice. There must be a better way to phrase that...). There's nothing better than seeing a suitcase full of tapes from one of your favourites... except when you realize you don't have enough cash for all of them. 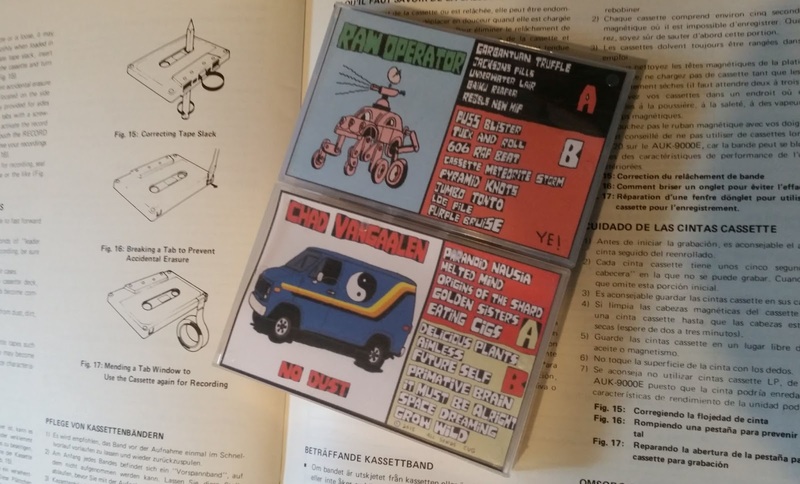 We grabbed two tapes, anyways: Raw Operator, a tape of infectious, electronic-based musics; and No Dust, b-sides/demos from Shrink Dust (including a version of the amazing "Primative (sic) Brain." These pretty much cement our belief that Vangaalen is an other-worldly genius.